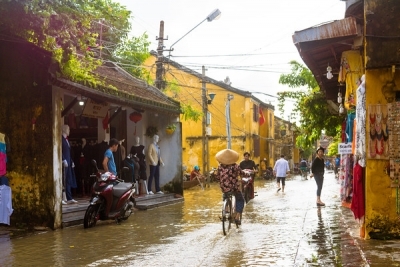 Hoi An is the best example of a traditional trading port in South-East Asia. It is the result of a fusion of cultures over time, from the 15th - 19th century. Hoi An attracted ships and traders from the rest of Asia and Europe. Its architecture is of traditional Vietnamese design, with Chinese and Japanese influences. Comparisons are made with Vigan (Philippines), which however has a Spanish colonial street plan as in the Americas where Hoi An organically evolved. It is also exceptional for the use of wood as a building material. Not many WHS, especially in Asia, come as touristy as this one. It attracts bus (and probably plane) loads of western tourists, mainly on group tours. They behave like they're in Thailand, and have come for the shopping, the beach, the beer. I had a hard time seeing the town, the 4 roads that comprise this WHS that is, as a cultural heritage site. One morning I bought a ticket that gives you entrance to 5 historic buildings in town. You can choose whichever 5 you like from the about 20 that open their doors to visitors. Though all the other buildings in town are very welcoming too, as they are either restaurants or silk/clothes shops. I enjoyed the Tan Ky house the most - an old merchant's house with its back to the river (to easily load the merchandise) and the front at the town's main street. The houses in this area of Hoi An always have been very susceptible to floodings - inside Tan Ky there are markings on the wooden beams to show how high the water reached in which year. 1.5 to 2 meters is no exception. I've now visited all 3 Asian trading ports on the List (Vigan, Melaka and Hoi An) - and none of those 3 did really impress me. Hoi An did remind me of Ping Yao: the dark wooden structures of the houses, the Chinese influences in the Vietnamese houses. Ping Yao, though touristy as well, is much more a living town, much bigger also and with a higher variation in its historic remains. 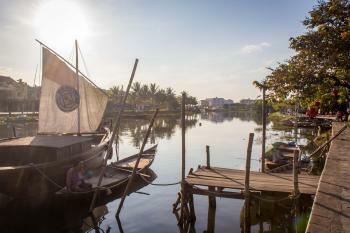 Hoi An is utterly charming and one of the picturesque town in Vietnam. I had two weeks in Hoi An and bought two tickets, which allowed me to visit 10 of the sites in town (you get 5 per ticket). The town itself allows you to really see what a traditional trading port looks like. Most of the buildings date from the 18th century, although there are elements dating back to the 15th. I was there doing floods, which happen about once every 10 years, if not more frequently as global warming changes things. This was interesting because the Old Houses actually have pulley systems in place to protect the furniture. Much of the furniture decorating the traditional houses are intricately carved pieces of teak inlaid with mother-of-peal. So, since the flooding is fairly common (and a few houses track the historical levels of past floods with tick marks on a wall), and some furniture is massive and heavy, the houses use these pulleys to raise the furniture either to the second floor, or secure against the ceiling. I found this entire process fascinating as it's a clear issue in the long-term sustainability of the town, but the locals have devised a system that has kept much of the houses and the interiors in pristine condition! I've visited other World Heritage towns (Luang Prabang in Laos and Antigua in Guatemala), and Hoi An is unique—unmissable if you're traveling to Vietnam. I have mixed feelings about Hoi An.It is a beautiful place - a charming little historic town that is completely authentic and has mainly the original buildings from when it was a trading port. It has a safe and friendly atmosphere and it is a joy to walk around and explore, or sit and spend an afternoon at a bar or cafe. Yet it is SO full of tourists and it just feels like the city has lost a little bit of its soul because of that. So many homes on the outskirts of the historic centre have become guesthouses and now tourists sleep where relatives once might have. I feel like everyone with a motorbike sees themselves as a potential taxi driver. And then there are the women shouting desperately for me to “buy something”. I enjoyed my time there and I don't blame the locals for making an income from all the visitors. But it does affect my overall view of the site. 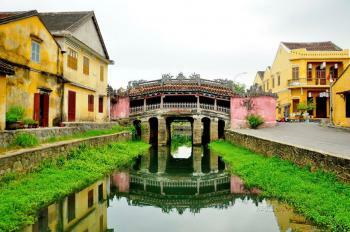 Maybe I have seen many old port cities in Guangdong and Fujian as well as many old historic small towns in China before, so I did not feel any special toward the architecture in this popular World Heritage Site of Hoi An; however, this city still has its uniqueness in my opinion. I arrived in Hoi An around 9 PM after 2 hours delay flight from Ho Chi Minh City and another 45 minutes wait on plane because of congestion at Danang Airport. I really relieved when I discovered that the whole town was peacefully quiet, something I really concerned that Hoi An at night may has the same fate of Lijiang or Fenghuang that historical towns become crazy club scenes. In the next morning I woke up very early since at 5 AM Viet Nam’s sky is already bright like 7 AM. I walked around the town admiring waterfront area where local fishermen were ready to go-out for day fishing, the very lively market and extremely charming and empty streets. Since there was no tourist, only locals and the souvenir shops were still close, I felt that Hoi An at that moment was an extremely gorgeous place to visit. The yellowish Chinese styled shop-houses along the street together with decorative bushes of bougainvillea flower are lovely sights and very photogenic. Most of highlight buildings are merchant’s house and Chinese clan houses and shrines. I found that the clan houses are strictly built in “Min Nan Style” of Chinese architecture which can be found everywhere from Taiwan to Singapore. The layout of houses that claimed to be unique for not strictly complied with Feng Shui for benefit of better ventilation in tropical region are also similar to Malaysian Georgetown and other places in Southeast Asia. The French colonial influence is the only thing in my idea that makes Hoi An different from other Asian World Heritage Site port town. Another thing that I really impressed is the preservation of the whole town which is very amazing and very authentic, which is a thing that cannot be found in Georgetown, Melaka, Singapore or Macao. The Japanese Bridge is maybe the only sight that I found very interesting for its stories that Japanese built this bridge in order to calm evil serpent spirit “Namazu” that caused earthquake in very faraway Japan since they believe Hoi An is located on the back of the serpent. 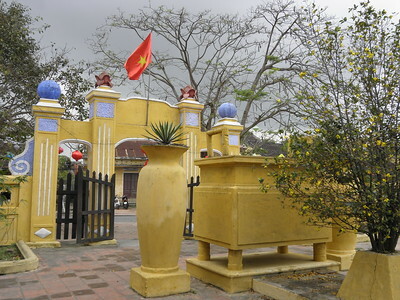 I further explored the town and strangely found that outside the inscribed zone, there still has many nice shrines especially the one dedicate to Confucius which has more unique and interesting Vietnamese elements more than the preserved ones in the core zone. Then I tried local cuisine, after read raving reviews in TripAdvisor, I chose to eat White Rose, Hoi An Fried Wanton and Cao Lao noodle. The foods except noodle were lovely and must eat. I also noted that Hoi An is not only popular with European tourists but also Korean, Japanese, Australian and New Zealander. Also the late afternoon is the most crowded time when all the tour buses of Chinese and Vietnamese tourists arrive in town for few hours stop. After sunset, the whole town waterfront becomes a night market with many local foods. And Hoi An is very charming with hundreds of paper and silk lanterns. Hoi An at night seems to be a very popular place for pre-wedding photo shooting, as I saw many Vietnamese couples in their traditional dresses with their photographer teams everywhere especially around Japanese Bridge, so a great place to see local contemporary wedding cultures. All in all I really enjoyed my time in Hoi An for its lovely atmosphere and nice townscape. Even though the historic area is already changed for tourism industry but because of surrounding living areas especially the central market is still coexisting with historic area making the old town still lively with locals. I think this kind of urban planning is very good example for continuing the historic town development, a really contrast with Lijiang or Luang Prabang that freeze the towns by building new commercial area outside historic areas. This will be my fourth trip to Hoi An. Obviously, I love it, not only for its physical beauty, which is extraordinary, but for the many diversions it offers and the warth of its people. I stay for two weeks and am always sad to leave. It is a city in which to wander and enjoy the serendipidous encounters and diversions. I live in Paris, so a place has to be very special in order to draw me away each year. Dear Frank, Hoi An is my favorite destination in VN..so apprciate what u wrote about it. The noodle u mentioned above is generally called as " My Quang" or "Quang noodle", the most delicious i enjoyed is at a small restaurant at Ly Thuong Kiet.st, can't remember the name. Sorry, welcome back..
My wife and I visited HoiAn in 2008. We stayed at a hotel right on the river. Wonderful, even convinced the waitress' and waiters to jitterbug with us on the balcony overlooking the river that evening. Truly a great time to remember. Nice folks, great shops, prices are very reasonable. We enjoyed cooking classes at the hotel in the morning, enjoyed cooking our own brunch. But only after the head chef took us across the river personally to the open air vegetable and seafood market to buy our ingredients for our lessons. Lots of fun. The market on the river is amazing. So much seafood, and so fresh. We were surprised, not one trace of a "fishy" smell. How do they do it? So clean and neat. Can't remember the name of a particular noodle that is said to be made only there, because of the water used. Very tasty, sorry I can't recall, but seems to be popular there, probably ask any local and they would know. Had a terrific hand tailored suit made in less than four hours, for way less than a hundred dollars. They even delivered it to the hotel that evening, what a deal. Beautiful material, price included a new shirt and a custom handsewn tie that I got to pick out the material also. If you can, see HoiAn, nice place, I will go back. Beautiful architecture, especially along some of the river, very interesting. Boat rides available, but we preferred to walk. Take in more of the scenery,slowly that way, it seemed to us. As you can tell, we liked HoiAn. You should also consider DaLat in the mountains. Beautiful French colonial, high in the mountains, cool mountain air, lakes, even has it's own miniature eiffel tower. It's here that they commercially grow flowers for a lot of that part of the world, we were told. The flowers in the market and street vendors are spectacular. Nice photo ops there. Stayed at a hotel across the street from the lake, what a sunrise. Watched folks doing their tai chi exercises all up and down the sidewalk on the lake at sunup. Wife found it magical, I enjoyed the coffee and early morning fare, al fresco on the hotel patio. Very nice hotel, "Emerald Palace? ", "Emerald Hotel? ", something like that. Great rooms, stunning views of the lake and mountains in you get a room on the lake side. Hoi An seemed to be a nice place. I only had about an hour to visit though since my family and I had to get back to Hue that night. I spent that one hour walking around the old streets and visitng the old bridge built by the Japanese a few centuries ago. I hope to be able to visit this city for a longer period in the future. Dog statues: Japanese Covered Bridge: At one end of the bridge, there is a sculpture of dog and on the other end of the bridge here is a sculpture of monkey. These two animals are symbol of sacredness in Japanese culture. Another reason behind these animal sculptures is that according to the Asian zodiac signs, in the year of monkey and the year of dog many of the Japanese emperors were born. Records also say that the construction of the bridge was initiated in the dog year and was finished in the monkey year. Fusion: "Hoi An is an outstanding material manifestation of the fusion of cultures over time in an international commercial port."